With this tutorial you will learn basics about remote Windows desktop and applications control with Monflo app for PC. 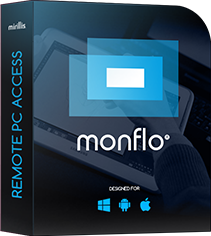 Remote PC desktop control with Monflo app is very easy and intuitive. Please read information below to quickly learn remote Windows desktop control basics in a few short steps. After successfull connection to Server PC, Monflo Client app opens a new window with audio and video from your Server PC. Move your mouse over video area to control your Server PC. All mouse and keyboard actions will control your Server PC just like you would sit in a front of your Server PC. To switch control to your host PC simply move your mouse out of Monflo Client window. User Options window to terminate current connection or to logout. In fullscreen mode Monflo Client provides all buttons on special control panel located at the top of the screen. If fullscreen control panel is not visible please use a hotkey RCTRL + M to show control panel. Use Hide control panel button to hide control panel. You can move control panel horizontaly to adjust position to your needs. To move control panel please click on Monflo logo, hold left mouse button down and move mouse horizontally. In fullscreen games Monflo Client hides the control panel automatically. Press RCTRL + M hotkey to access Monflo Client's control panel and switch control to your host PC.